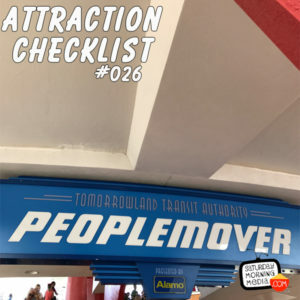 http://www.attractionchecklist.com – It’s time to take a spin on one of Magic Kingdom’s classic attractions, the Tomorrowland Transit Authority PeopleMover. This episode we take a ride around Tomorrowland on it with friend to the show, John B. deHaas. Recorded during on May 25, 2017. This episode we are going to Magic Kingdom in Walt Disney World to enjoy the classic disney attraction, the Tomorrowland Transit Authority PeopleMover presented by Alamo. The guide map describes this attraction by saying: Ride this emission-free mass transit system of the future. There are no height or age requirements for this ride and the thrill level is describes the ride as being a slow ride. 1. This attraction, originally called the WEDWay PeopleMover, opened on July 1, 1975. It was based on the PeopleMover at Disneyland Park in California. In 1994, when tomorrowland was receiving a complete overhaul, the name of the ride was changed to the Tomorrowland Transit Authority Peoplemover. 2. The Tomorrowland Transit Authority is powered magnetically with linear induction motors making it completely emissions free. 3. The narration for the current version of the Tomorrowland Transit Authority PeopleMovier is provided by Mike Brassell who also serves as narrator for the Living With The Land attraction at EPCOT. 4. One of the highlights of any ride on the Tomorrowland Transit Authority Peoplemver is passing by the model for Progress City. The portion of the model seen on the attraction today is just a small part of the original model which served as the preview for Walt Disney’s vision for EPCOT. And now it’s time to ride the Tomorrowland Transit Authority PeopleMover. Joining us again today is John deHaas and after we ride we’ll discuss our thoughts on this classic Magic Kingdom attraction. If you have headphones, put them on now as this is a binaural recording of the Tomorrowland Transit Authority Peoplemover.